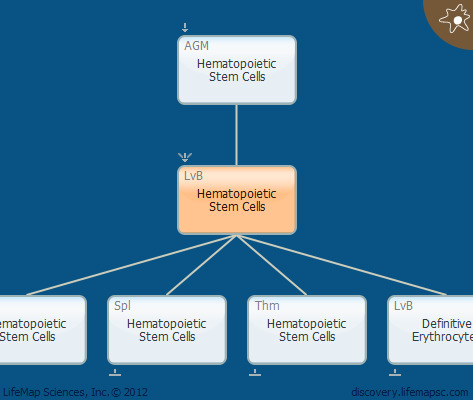 Hematopoietic stem cells are multipotent, myelolymphoid stem cells, which serve as a source of hematopoietic cells. These cells colonize the fetal liver (liver bud) by migration from the Aorta-Gonad-Mesonephros (AGM) region (dorsal aorta) and from the Yolk Sac (YS contribution is still debated). In human: dpc 50. These precursors are Lin- (lineage-negative), meaning that they lack detectable surface markers of the T, B, macrophage, granulocytic, and erythroid lineages.